The semester is getting under way here in Costa Rica! It has been about a week and a half since we got here but I think we all agree that our campsite at Osa Conservation’s biological station already feels like home. Really, we’ve only been here for a week, since the first few days of the program were spent in San José. We spent three nights after we arrived staying in a hotel near downtown San José. We woke up on the first morning and had what I think we can all agree was the best hotel breakfast of our lives, which included copious amounts of fresh fruit as well as pastries and a fresh omelet bar. After this delicious introduction to Costa Rica, we had a morning of orientation, before setting out to find lunch and explore the city. After walking through parks and crowded downtown streets, we entered a huge indoor market with tons of stores selling everything from fresh fruit to musical instruments. We ate lunch at a restaurant near the center of the market and bought unusual varieties of fruits to try from one of the stands. We ate maracuya (passionfruit), raw cacao beans, and fresh mangoes that night while continuing our orientation and having our first lectures. 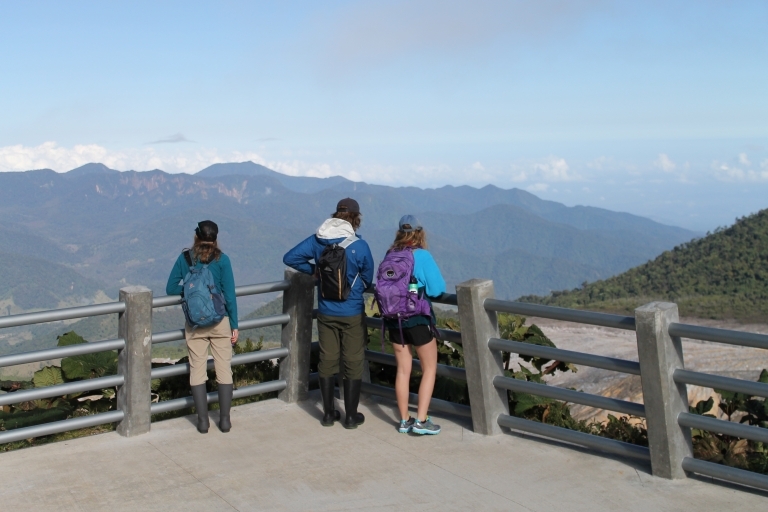 Carolina, Max, and Brenna enjoying the views at Poás Volcano National Park. Photo by Katie Goodwin. The next day we got up bright and early and headed to Poás Volcano National Park. Poás was our first opportunity to experience up close some of the natural beauty that Costa Rica has to offer. It was the first national park established in Costa Rica, and is also one of the most visited. We got there early before the crowds and enjoyed unobstructed views of the beautiful volcanic crater and lagoon. This was also our first to chance to practice Costa Rican plant and bird identification. A couple of former Round River students, who are now botanists, joined us on our journey because they were looking for a rare fern. I don’t think I have ever seen anyone as excited about ferns as our botanist companions, and I definitely have never learned so much about fern ecology in one day! 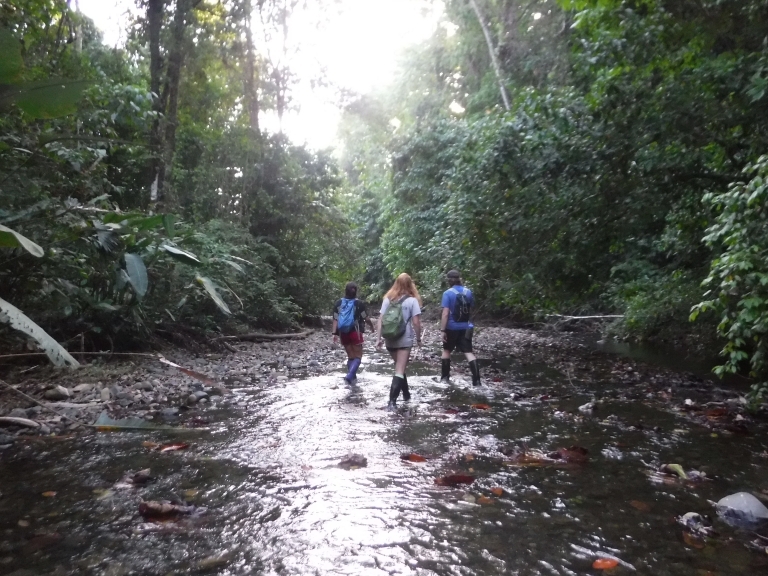 The next day, it was time to make the long journey to our home for the next three months on the Osa Peninsula. After an eight hour bus ride through varying landscapes, we arrived in Puerto Jiménez. The next leg of our journey, the following morning, was taking public transportation in the form of a colectivo (bus) to the research station run by Round River’s local partner Osa Conservation. This research station hosts volunteers, students, and visiting researchers year round. Our campsite is just a short walk from the main driveway of the station, set a little ways back from the road. We have a tent platform and a kitchen platform with a dining room table and support poles that are perfect for setting up hammocks across, which instructors Eli and Chris did before we got there. 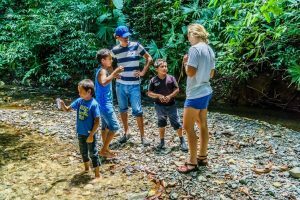 After setting up our tents and organizing our kitchen, we set out on a natural history walk down one of Osa Conservation’s trails to experience the biodiversity of the Osa. As we walked, scarlet macaws flew overhead and toucan calls could be heard from the forest around us. A rustling in the trees above us turned out to be a small group of spider monkeys, which looked down at us with curious eyes before continuing on their way. We saw leaf cutter ant trails crisscrossing the forest floor and learned about how they use piles of leaf pieces to grow the fungus that they eat. The diversity of plants and animals was more intense than we could have imagined, and we spent so much time looking at birds that our two hour long walk only took us half a kilometer or so down the trail. 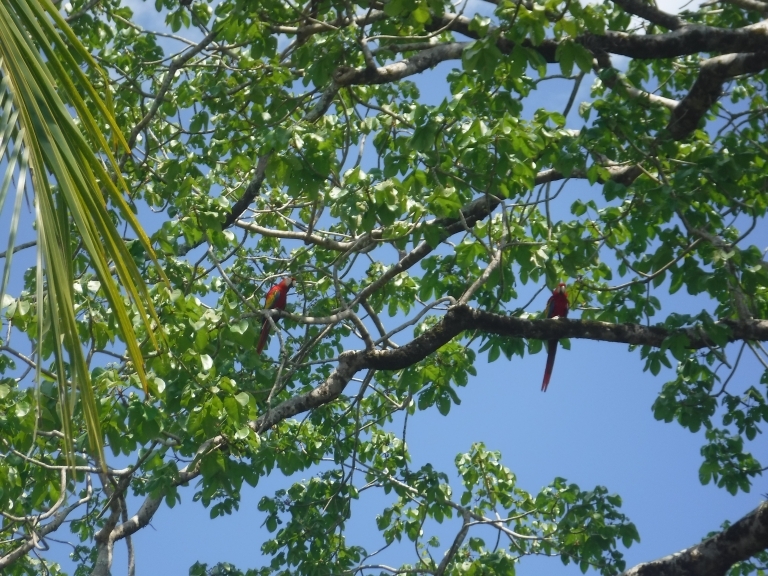 A pair of scarlet macaws perched in a tree above us. Photo by Carolina May. 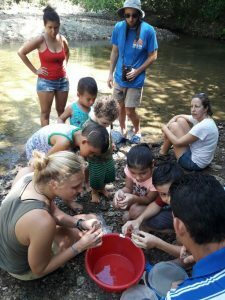 During our first week here, we surveyed the Cayunda River for signs of the endangered neotropical river otter, which turned out to be the perfect thing to be doing on a hot humid tropical day. We waded down the cool stream measuring habitat features and their use by the otters, while also seeing lots of cool wildlife- like nesting hummingbirds and basilisk lizards that would run across the water to hide on the bank as we approached. Of course, there was also time for swimming in some of the deeper pools when we stopped for lunch or to cool off at the end of the day. Walking the trails around the the biological research station. One morning, we went to help out at Finca Osa Verde, the sustainable agriculture project run by Osa Conservation. At this finca, the goal is to be entirely self-sufficient and grow organic and sustainable food. After a tour of the farm, we helped plant a few rows of corn, beans, and garlic. We also drank coconut milk and ate the meat of fresh coconuts from the farm to cool us off as the day got hotter. 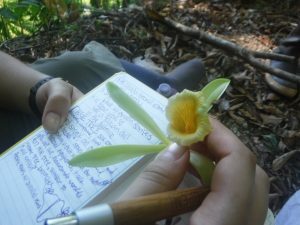 Taking notes on the wild vanilla flower we found on the way to Cerro Arbolito. Photo by Carolina May. At the end of the week was our short backpacking trip to the old town of Cerro Arbolito to set up camera traps. The site is at the top of a small mountain at the tip of the Osa Peninsula. It was abandoned years ago but the old roads and paths are now used by wildlife and provided us a lot of open areas to set up the cameras. On the hike up we saw and learned about plants that we hadn’t seen before, including the sacred Ceiba tree, whose branches are said to transcend the worlds, and the wild vanilla orchid. The top of the mountain provided views of the Golfo Dulce and the Pacific, as well as glimpses of Corcovado National Park and Panama. We will be going back up to Cerro Arbolito in a few weeks to collect the cameras, and hopefully find photos of some cool wildlife on them! Manuel, the sea turtle guardian. Holding either his camera and backpack, or plastic buckets filled with sand after releasing baby sea turtles, a young guy approaches the biological station from the trail where the rainforest meets the sea. 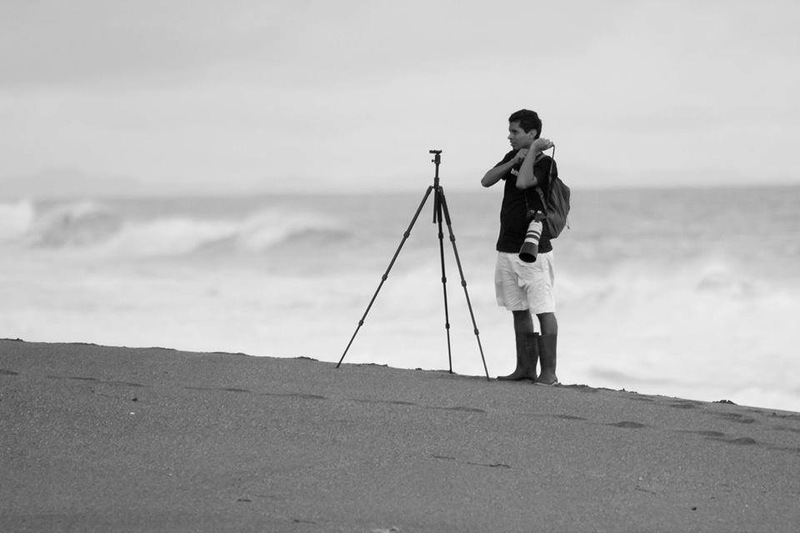 It is Manuel Sánchez, Osa Conservation´s Sea Turtle Program coordinator. He was 5 years old when he saw a sea turtle for the first time. A fishing night with his father Miguel became an adventure when they discovered the tracks of a green sea turtle, which they followed to a nesting female laying her eggs. “That is why I love green sea turtles so much; that was my first encounter with a sea turtle” he affirms. That encounter was in the sector 20 of Piro beach – the same beach he has been patrolling for the past 14 years since he started working for Osa Conservation. Native to the Osa Peninsula and the only staff member whose own house is located in Piro, Manuel started his work with sea turtles with his father by building a hatchery and relocating the nests to protect them from poachers. Then he continued as a field assistant in Carate, a nearby town, where he was discovered by Osa Conservation. 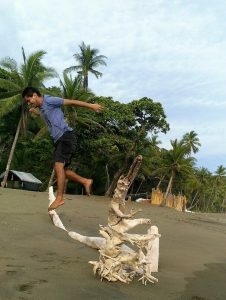 After working as a research field assistant for some years, he was offered the position of Sea Turtle Program Coordinator with Osa Conservation to monitor and conserve the sea turtles that visit both the Piro and Pejeperro beaches. The three biggest threats that sea turtles face worldwide are ocean pollution, egg poaching and incidental captures by a fishing practice called long lining. 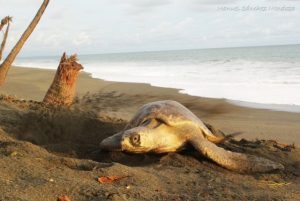 The beaches in the Osa Peninsula are visited primarily by two species of nesting turtles: olive ridley (Lepidochelys olivacea) and green sea turtle (Chelonia mydas). For Manuel, the most exciting moment of 2016 was finding four hawksbill sea turtle nests. And so far in 2017, he has already found a leatherback sea turtle nest and relocated the eggs to the hatchery! Leatherback sea turtles (Dermochelys coriacea) and hawksbill sea turtles (Eretmochelys imbricata) are only occasional visitors to the Osa, which explains his excitement (all four species of sea turtles are critically endangered!). Manuel is also a passionate naturalist. Anyone who has met him can attest to his knowledge and passion for nature. It is a passion that he likes to share with his younger brother and niece who often accompany him hiking, birding, patrolling on the beach or chatting with station staff. People like Manuel are a clear example of environmental progress in Costa Rica and in the Osa. In just two generations, many have been able to build livelihoods working directly in the conservation economy and in sustainable tourism. This is a huge step forward compared to just two generations ago when many locals resorted to logging the rainforests and hunting jaguars for their economic benefits. With an increase in conservation-oriented tourism and priorities in the region, it is hopeful that the impact will continue to increasingly provide the opportunities to nurture the local naturalists and conservation leaders, like Manuel, in the Osa. In the upcoming months, the Sea Turtle Program is expecting construction of a new camp base for the turtle volunteers, a new hatchery, an increase in the number of volunteers and the first leatherback hatchlings in a long time (as the eggs were relocated this past month). If you want to support Manuel`s work in the Osa, you can contribute with a donation for the program or by visiting Osa Conservation or volunteering with us. Trust me, releasing a baby sea turtle is a once in a lifetime experience! 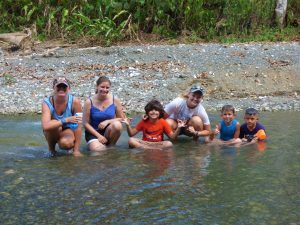 My name is Rachael Eplee, and I am the coordinator for Osa Conservation’s Rios Saludables (Healthy Rivers) Program. I graduated in 2016 from Virginia Tech with a Bachelor of Science in Environmental Policy and Planning and a Bachelor of Arts in International Development. In my first step into the professional world, I started working with Osa Conservation in July 2016 and have had the great pleasure of living in this rich and diverse environment ever since! My area of interest lies in human and natural system interaction and how that can be applied to development practices. Thus, the Rios Saludables Program, a community-based watershed monitoring program, is a natural fit! We seek to engage international students, local actors, and local communities in education, research, and evidence-based decision making in order to contribute to the greater conservation efforts in the Osa region. In Costa Rica, the greatest risk to water systems is not quantity, but quality. The Osa Peninsula has 46 individual watersheds, which means there are 46 major river mouths entering the Gulfo Dulce and Pacific Ocean. Each of these watersheds offer a picture into the composition of the land around it and can allow us to see the impact of land use, human interaction, and conserved lands around the river. We use chemical, macro-invertebrate, and bacterial testing to measure the quality of rivers that impact Osa’s communities. 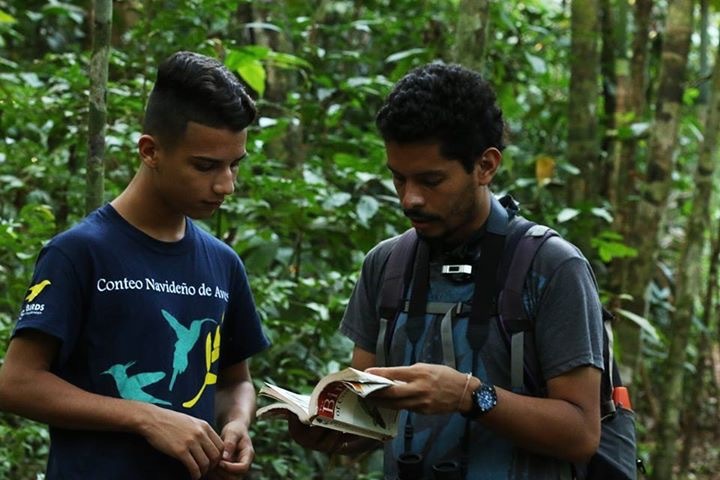 Through engaging citizen scientists in the Osa, we collect quality data while simultaneously using nature as a classroom to educate students of all ages and academic levels. The goal of the program is to create quality long term data in this region which is home to many farms and is in constant threat of rapid development. Long term data allows communities and conservationists in the area to advocate to municipalities and people making land-use decisions. The robust ecosystem has capacity to protect its natural systems internally, but only with the help of dedicated reforestation and wildlife conservation efforts. Rios Saludables has engaged over 60 individuals in 10 regions throughout the peninsula in education and data collection. We are excited to expand our impact by creating strategic plans with our local partners, including nearby eco-lodges and biological stations. From a personal standpoint, I see the success of this program lying in the hands of the incredible people of this region. Anyone who has had the opportunity to spend time in this place knows the importance of all conservation efforts in the region and knows that the best way to understand its true beauty is to take the time to see it through the eyes of the people who call it home. In the Osa, there is a deep understanding of the power and importance of nature – the opportunity to work in this place has given me a perspective that only the Osa can! Rios Saludables is a young program and is the culmination of the hard work of many people. As it gains strength and grows, this program will undoubtedly be impacted by many incredible scientists and nature lovers from all over the world. For me, spending the past year with this program has been a great pleasure and I will take the lessons it has taught me everywhere I go.